The Distance Learning Program is designed to aid those with a desire to learn Wing Chun who do not have access to a school or instructor in their area. It is also an opportunity for students to become certified and recognized in accordance with the International Wing Chun Martial Art Association ranking system, which is a necessary first step for those who wish to become IWCMAA Certified Wing Chun Instructors. Each level of the distance learning programs cover specific areas of their respective arts which the student must learn and demonstrate proficiency. Learning is accomplished through a combination of modern technologies such as video learning, digital correspondence, and e-mail directly with Master Chan to bridge the distance between student and instructors. 1. Submit the Wing Chun Distance learning application form. Pay the one time $65 registration fee. Tuition is not required for this program, but you have to purchase the required study materials. And pay the testing fee each time you test. 2. After studying and practicing the materials, record a video of yourself performing the required materials and upload to the Youtube or any video media of your choice, e-mail link to Master Chan for evaluation. 3. Master Chan will review and score your performance and skills demonstrated in your video. You will receive a certification for each level you pass, passing score is 75% or higher. 4. Time frame to complete the Distance Learning Program is no more than 3 years and 6 months. You can purchase either study material depend on your personal preference and goal. 1. WING CHUN HOME STUDY COURSE- Covered the entire Wing Chun system for all students. 2 WING CHUN MASTER LEVEL COURSE - Covered the entire Wing Chun system plus additional materials for advanced level study. 1. When you have mastered the necessary material from the Sil Lim Tau dvd, record a video of yourself demonstrating the Sil Lim Tau form. Upload to the Youtube or any video media of your choice, e-mail link to Master Chan for evaluation. 2. Register for Sil Lim Tau testing and pay the testing fee of $45. 1. When you have mastered the necessary material from the Chum Kiu dvd, record a video of yourself demonstrating the Chum Kiu form. Upload to the Youtube or any video media of your choice, e-mail link to Master Chan for evaluation. 2. Register for Chum Kiu testing and pay the testing fee of $45. 1. When you have mastered the section 1 to 3 from the Wooden Dummy dvd, record a video of yourself demonstrating the Wooden Dummy section 1 to 3. Upload to the Youtube or any video media of your choice, e-mail link to Master Chan for evaluation. 2. Register for Mok Jong level 1 testing and pay the testing fee of $55. 1. When you have mastered the Section 4 to 7 from the Wooden Dummy dvd, record a video of yourself demonstrating the entire Wooden Dummy from section 1 to 7. Upload to the Youtube or any video media of your choice, e-mail link to Master Chan for evaluation. 2. Register for Mok Jong level 2 testing and pay the testing fee of $55. 1. When you have mastered the Lok Dim Boon Gwan - Wing Chun long pole dvd, record a video of yourself demonstrating the entire Pole form with medium speed and full speed. Upload to the Youtube or any video media of your choice, e-mail link to Master Chan for evaluation. 2. Register for Lok Dim Boon Gwan testing and pay the testing fee of $65. 1. When you have mastered the necessary material from the Biu Gee dvd, record a video of yourself demonstrating the entire Biu Gee form. Upload to the Youtube or any video media of your choice, e-mail link to Master Chan for evaluation. 2. Register for Lok Kim Boon Gwan testing and pay the testing fee of $65. 1. When you have mastered all sections from the Bak Jom Dao - Wing Chun knives dvd, record a video of yourself demonstrating the entire Bak Jom Dao from section 1 to 8. Upload to the Youtube or any video media of your choice, e-mail link to Master Chan for evaluation. 2. Register for Bak Jom Dao testing and pay the testing fee of $75. 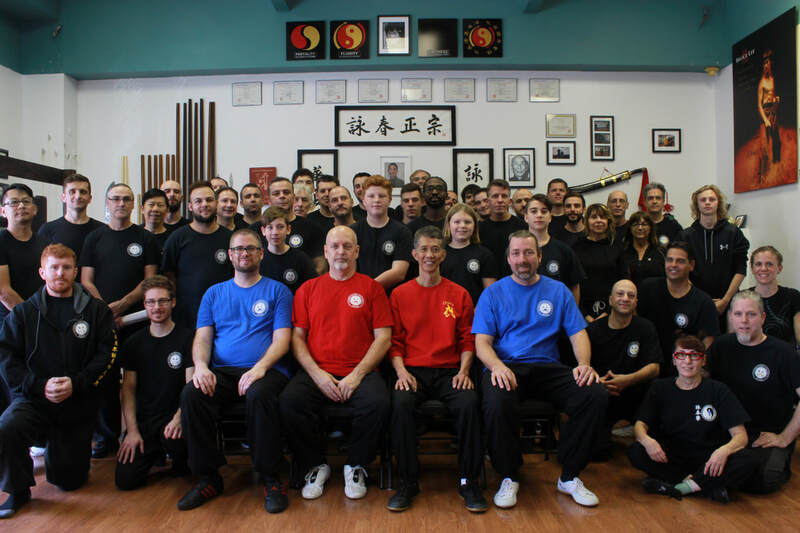 As a charter member of the International Wing Chun Martial Art Association, Chan's Kung Fu School provides expert instruction in all seven levels of the International Wing Chun ranking system. Proficiency in these levels is also a prerequisite for individuals who wish to become certified Wing Chun instructors.